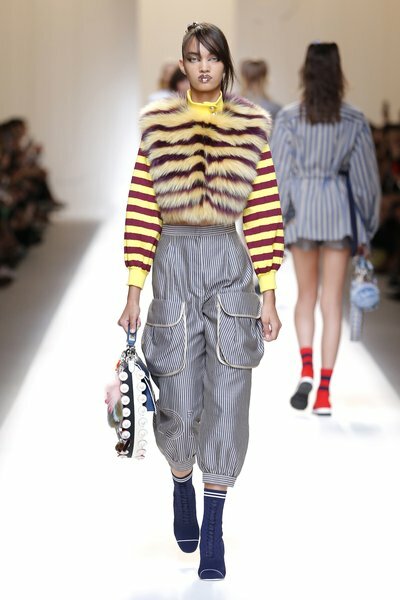 In a flourish of decorative opulence twisted with an athletic élan, Karl Lagerfeld reflects on a modern rococò muse for the FENDI Spring/Summer 2017 Collection. The cascading silhouette falls in light volumes from a cinched waist, accented by lingerie worn beneath floating aprons and ribbon-tied gowns. Playful proportions infuse workwear shapes with imperial grandeur; rosette and bow appliqués blossom down a cotton twill sleeve, and cargo pockets shape blazers with a peplum flair. A sorbet palette of apricot, blush pink and pale mint is warmed by the sportif touch of scarlet, burgundy and marigold stripes. Embossed satin and patent leather take a liquid sheen, whilst French garden florals glisten across metallic fil coupé, cloque jacquards and sheer organdy prints. From filigree embossing to encrusted tulle and fantasy intarsia, exquisite fabrics are nuanced with both rich and diaphanous textures, balanced by the return of the iconic FENDI Pequin and Regimental stripes for a sense of uniform rigor. Complementing pointelle knit sweaters, the season’s stretch calf-length boots and trainers are striped with bands of colour and laced with grosgrain ribbon. The Spring/Summer 2017 fashion show debuts the new Kan I stud lock bag dotted with candy-coloured studs, rosette embroidery and floral ribbons. They match the signature Peekaboo and DotCom bags shown with an eclectic mix of embellished Strap You in multiple lengths.